Home Featured Articles April 2012 News: Sandi is Our Champion! We would like to say a Big ( Bariatric) Well Done! 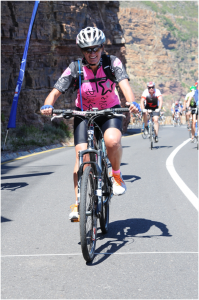 to Sandi Loggenberg for Completing the Cape Argus Cycle Race. Sandi, You are a true Champion. Last year, I asked a couple of friends if they’d join me doing this race and after a bit of convincing they were in. Little did I know at the time what we were in for! 110km on a bicycle, is not for the feint hearted. I prepared well and did other races before the Argus and found that at about 65km into a race my legs muscles took strain. After speaking to many people I found no one really understands sports nutrition when it came to bariatric patients. Finally, I had to do a lot of research and found what I need to eat on races to keep me well fueled. Dates and sweet potatoes were my answer. This helped tremendously on the Argus! I really wanted to do a sub 5 Argus and my time was 4hours 51minutes. I was blown away that I did it!